All pro ranges offer plenty of power. So what sets them apart from each other? It all depends on how you cook. Use the filters below to narrow down your preferences to the brands offering your perfect pro range so you can focus on a few options when you visit our showrooms. 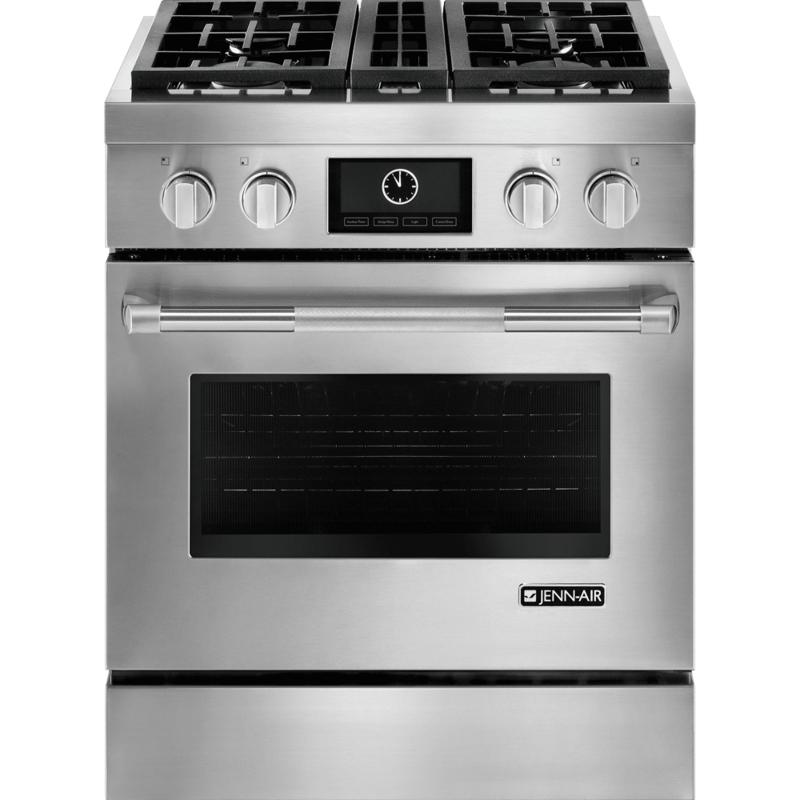 30” RangeNote: The 30” Range comes with 4 burners and a single oven, with no griddle or grill options. 4. Select all desired options. 6. Select all desired options. 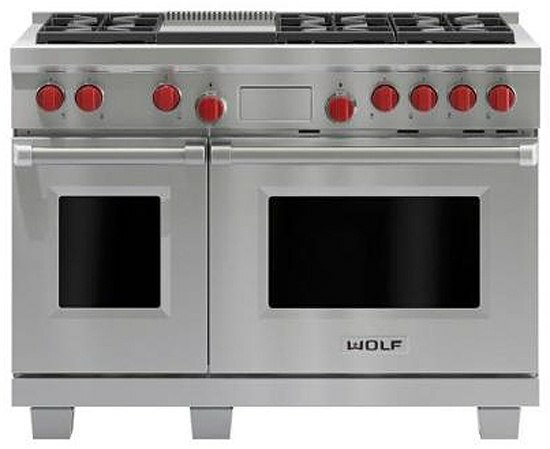 This Wolf 30-inch professional gas range allows you to sear, simmer, saute, and bake like a chef with professional features. This pro range has four sealed, dual stacked burners allowing you to have a maximum heat of 15,000 BTUs or a low simmer on every burner. At 15,000 BTU's, it is not a powerful range. However, it's perfect for rapid boils and simmering. Wolf's convection oven in this range provides even cooking results and has an infrared broiler, excellent for faster, more consistent temperatures. 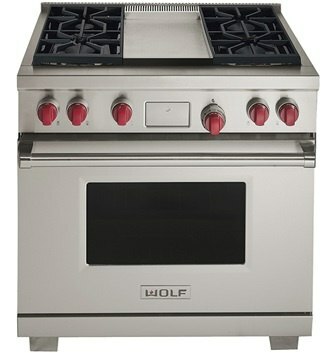 This Wolf 30-inch professional all gas range combines gas and electric cooking for the best of two worlds. This range has a gas cooktop and an electric twin convection oven with 10 cooking modes such as Convection Bake, Proof, Dehydrate, and Convection Roast. The Wolf twin convection is unique because both systems monitor temperature for more consistent heat. This range's dual stacked burners have a powerful high of 20,000 BTUs and a low less than 300 BTUs providing precise results. It also has self-cleaning and a delayed start - great for convenience. This Wolf 36-inch professional gas range has six sealed, dual stacked burners with an 18,000 BTU infrared broiler for rapid sears. The burners will reignite for controlled temperature and safety. The electric convection oven features 10 cooking modes such as Convection Bake, Proof, Dehydrate, and Convection Roast. Wolf's oven provides even cooking results and has an infrared broiler, excellent for fast preheat times and crisping. It also offers a delayed start and is self-cleaning. 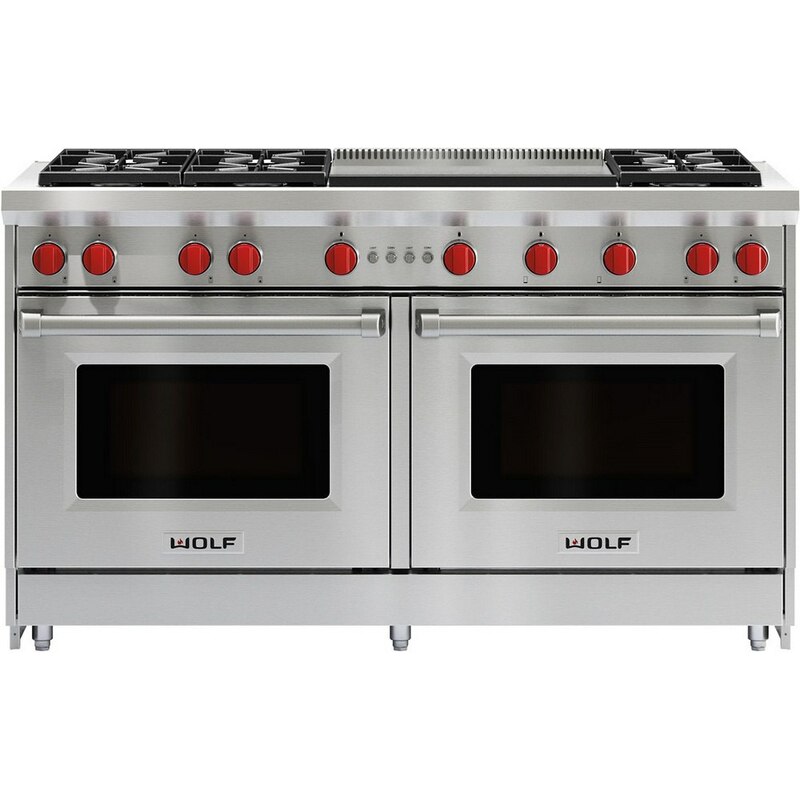 This Wolf 36-inch professional dual fuel range has sealed, dual stacked burners with a 20,000 BTU burner for rapid sears, an infrared broiler, and the options of a grill or griddle. Their burners each have a spark ignition system and sensor to detect if a flame is blown out. The burners will reignite for controlled temperature and safety. The electric convection oven features 10 cooking modes such as Convection Bake, Proof, Dehydrate, and Convection Roast. Wolf's oven provides even cooking results and has an infrared broiler, excellent for fast preheat times and crisping. It also offers a delayed start and is self-cleaning. 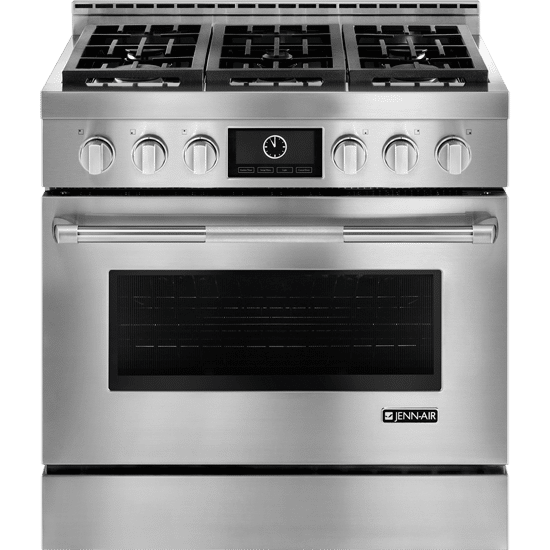 This Wolf 48-inch professional gas range has eight sealed, dual stacked burners with an 18,000 BTU infrared broiler for rapid sears. Their burners each have a spark ignition system and sensor to detect if a flame is blown out. The burners will reignite for controlled temperature and safety. Wolf's oven provides even cooking results and has an infrared broiler, excellent for fast preheat times and crisping. It also offers a delayed start and is self-cleaning. 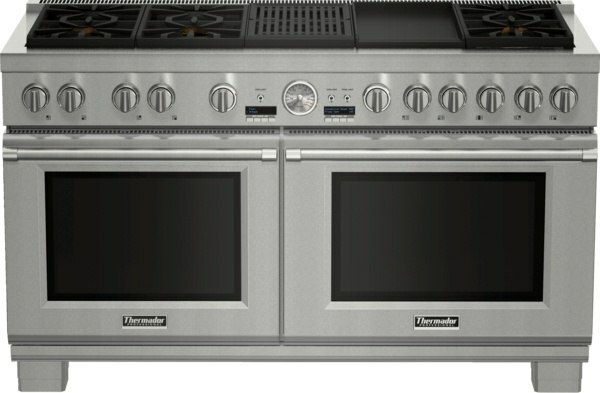 Lastly, at 48-inches, this range has a second non-convection 18-inch oven. 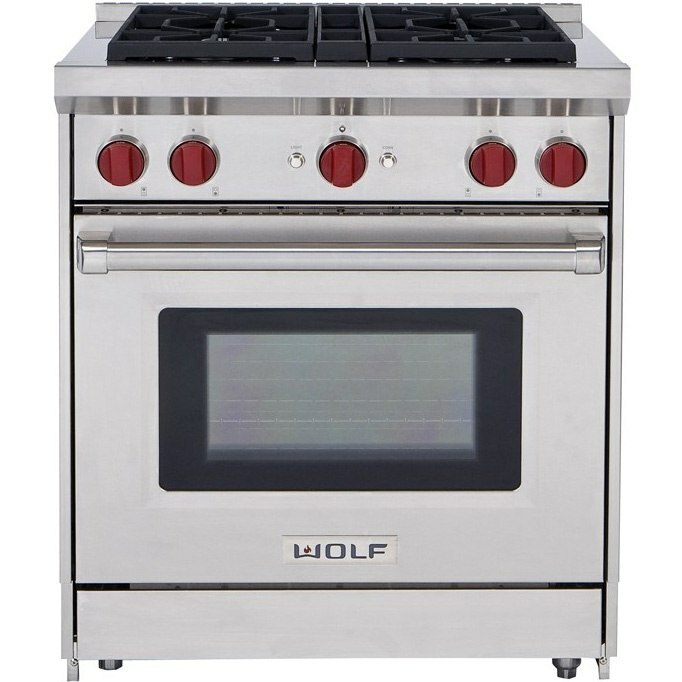 This Wolf 48-inch professional dual fuel range has 4 sealed, dual stacked burners with an 18,000 BTU infrared broiler, a simmer as low as 300 BTUs, and some models have the option of an infrared double griddle. The dual infrared griddle can deliver up to 30,000 BTUs of heat. Think sizzling fajitas. Their burners each have a spark ignition system and sensor to detect if a flame is blown out. The burners will reignite for controlled temperature and safety. The electric dual convection oven features 10 cooking modes such as Convection Bake, Proof, Dehydrate, and Convection Roast. Wolf's oven provides even cooking results and has an infrared broiler, perfect for crisping. It also offers a delayed start, temperature probe to take the guessing out of cooking, and is self-cleaning. 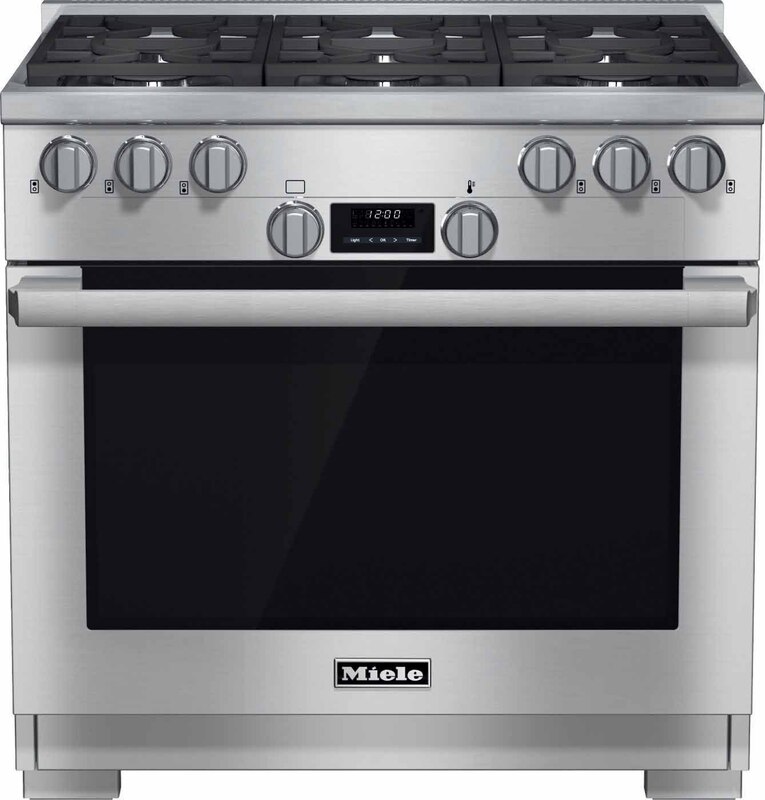 Lastly, at 48-inches, this range has a second non-convection 18-inch oven. 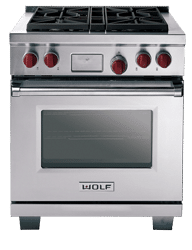 This Wolf 60-inch professional dual fuel range has sealed, dual stacked burners with an 18,000 BTU infrared broiler, a simmer as low as 300 BTUs, and some models have the option of an infrared double griddle. The dual infrared griddle can deliver up to 30,000 BTUs of heat. Think sizzling fajitas. Their burners each have a spark ignition system and sensor to detect if a flame is blown out. The burners will reignite for controlled temperature and safety. Underneath the cooktop is two 30-inch convection ovens. Wolf's ovens provide even cooking results and have an infrared broiler, perfect for crisping. It also offers a delayed start, temperature probe to take the guessing out of cooking, and is self-cleaning. 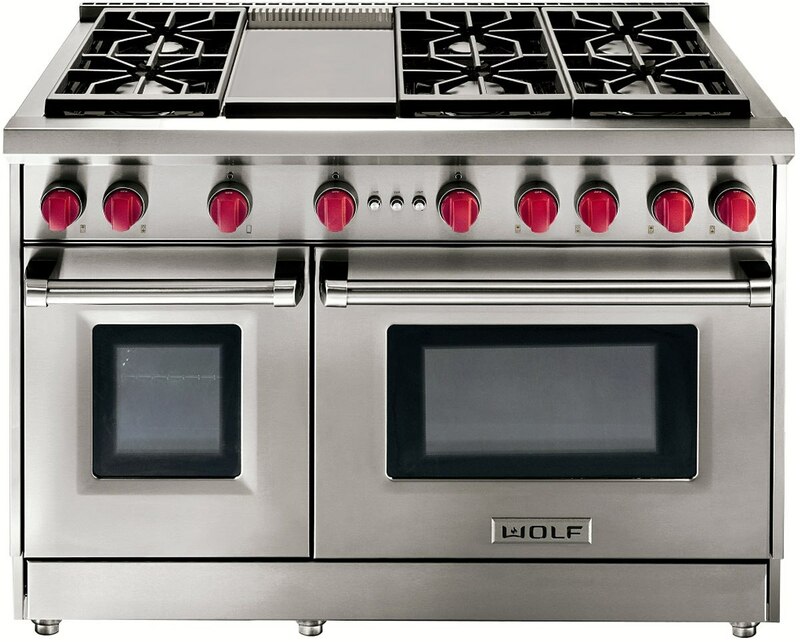 This Wolf 60-inch professional dual fuel range has sealed, dual stacked burners at 20,000 BTUs, a simmer as low as 300 BTUs, and some models have the option of an infrared double griddle. The dual infrared griddle can deliver up to 30,000 BTUs of heat. Think sizzling fajitas. Their burners each have a spark ignition system and sensor to detect if a flame is blown out. The burners will reignite for controlled temperature and safety. Underneath the cooktop is two 30-inch convection ovens. The dual electric convection ovens feature 10 cooking modes such as Convection Bake, Proof, Dehydrate, and Convection Roast. Wolf's ovens provide even cooking results and have an infrared broiler, perfect for crisping. It also offers a delayed start, temperature probe to take the guessing out of cooking, and is self-cleaning. 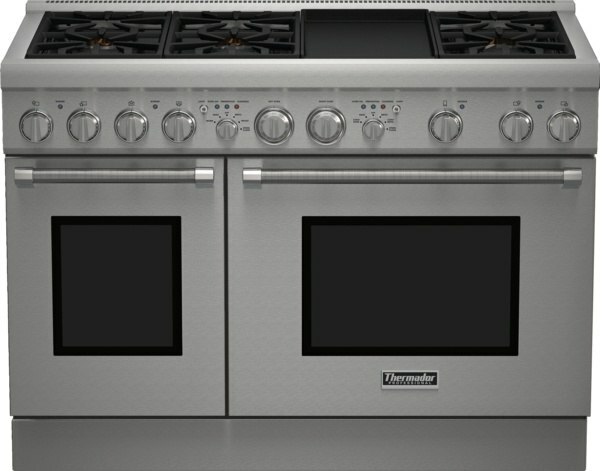 Miele's 30-inch all gas range has four dual stacked burners and a twin convection oven for consistent and even heat. Three burners offer up to 19,500 BTU's of heat and one with a high of 12,500 BTUs for simmering. The convection oven is self-cleaning for an effortless cleanup and features four modes, Convection Bake, Convection Roast, Bake, and Maxi Broil. Not to mention, Miele's twin convection oven offers Residual Heat Utilization that will turn off early and use the residual heat to complete the cooking process for better sustainability. 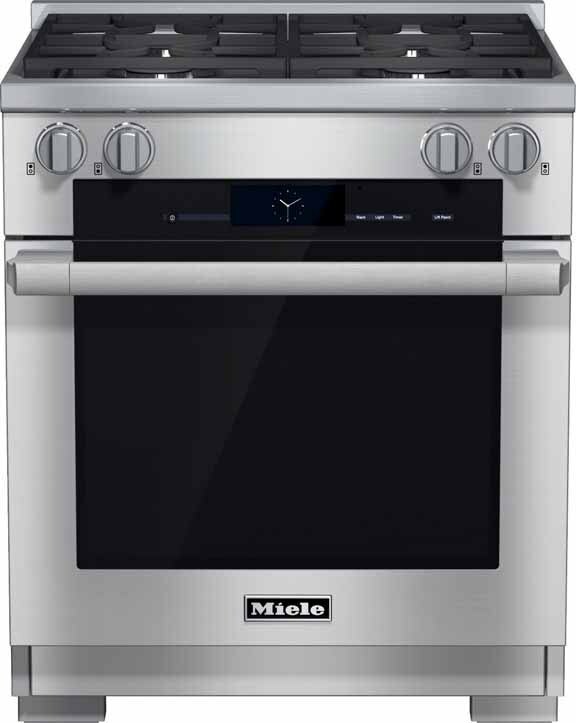 Miele's 30-inch dual fuel range has four dual stacked burners and a twin convection oven for consistent and even heat. Three burners offer up to 19,500 BTU's of heat and one with a high of 12,500 BTUs for simmering. The convection oven is self-cleaning for an effortless cleanup and features Miele's Master Chef and MasterChef Plus Automatic Programs for customized and gourmet cooking including 21 modes. Not to mention, Miele's TwinPower convection oven offers a Soft close and Soft Open door to prevent slamming. 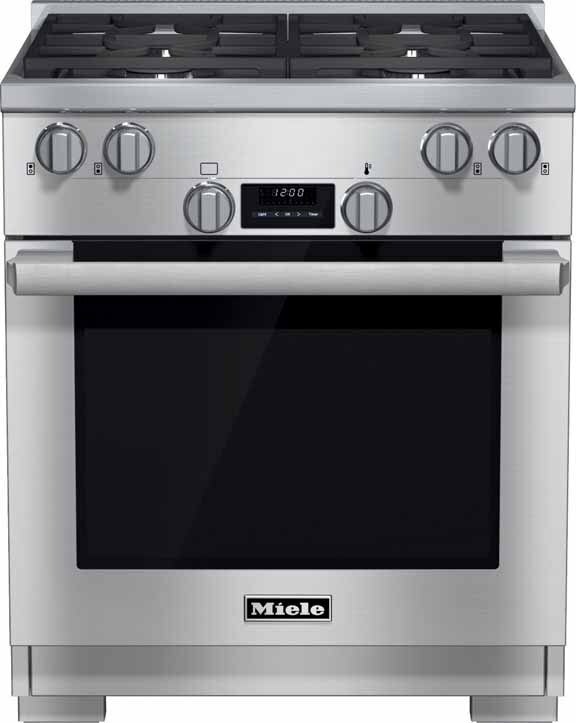 Miele's 36-inch all gas range has four dual stacked burners, a 13,000 BTU griddle, and a twin convection oven for consistent and even heat. Three burners offer up to 19,500 BTU's of heat and one with a high of 12,500 BTUs for simmering. This 5.76 cu. ft. convection oven is self-cleaning for an effortless cleanup and features four modes, Convection Bake, Convection Roast, Bake, and Maxi Broil. Not to mention, Miele's twin convection oven offers Residual Heat Utilization that will turn off early and use the residual heat to complete the cooking process for better sustainability. 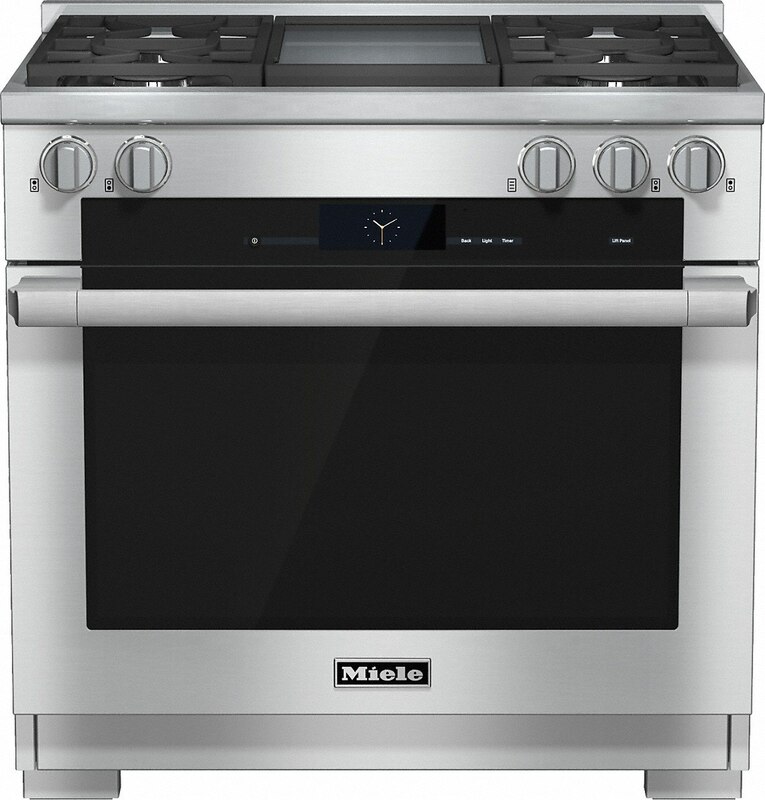 Miele's 36-inch dual fuel range has dual stacked burners and a twin convection oven for consistent and even heat. Three burners offer up to 19,500 BTU's of heat and one with a high of 12,500 BTUs for simmering. The 5.76 cu. ft. the convection oven is self-cleaning for an effortless cleanup and features Miele's Master Chef and MasterChef Plus Automatic Programs for customized and gourmet cooking including 21 modes. For improved roasting and baking, Miele's Moisture Plus ensures gourmet crisping, crusting, and moist results. Not to mention, Miele's TwinPower convection oven offers a Soft close and Soft Open door to prevent slamming. 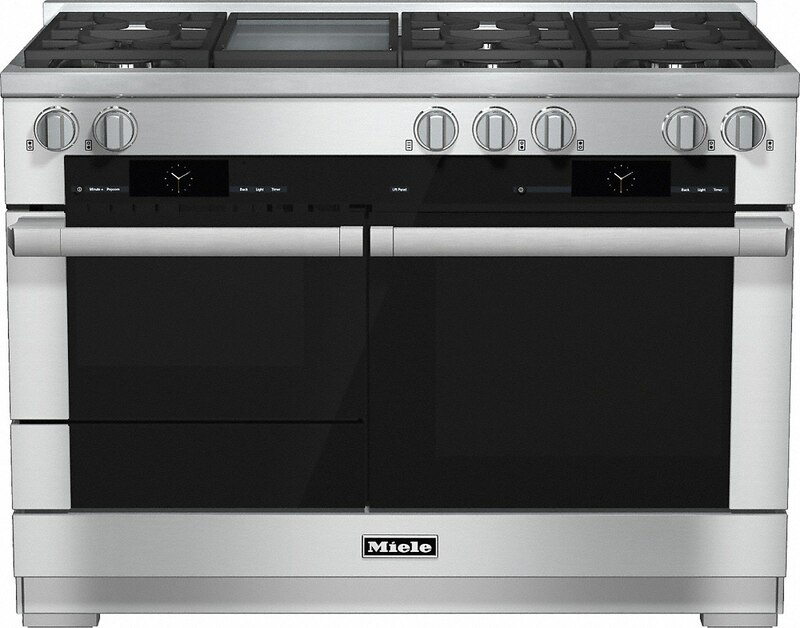 Miele's 48-inch dual fuel range has dual stacked burners, griddle and grill options available in select models, and a twin convection oven for consistent and even heat. Three burners offer up to 19,500 BTU's of heat and one with a high of 12,500 BTUs for simmering. The 5.76 cu. ft. convection oven is self-cleaning for an effortless cleanup and features Miele's Master Chef and MasterChef Plus Automatic Programs for customized and gourmet cooking including 21 modes. For improved roasting and baking, Miele's Moisture Plus ensures gourmet crisping, crusting, and moist results. Their wireless temperature probe is included with their 48-inch pro range. It's perfect for taking the guessing out of cooking. Not to mention, Miele's TwinPower convection oven offers a Soft close and Soft Open door to prevent slamming and their ComfortSwivel Handle. 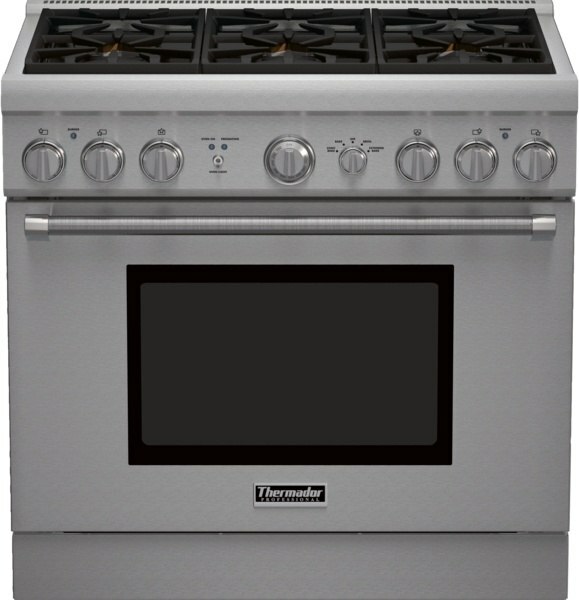 Thermador's Pro Harmony 30-inch gas range has four sealed Star Burners including two with an ExtraLow feature for simmering. Every burner has a high of 18,000 BTU's and a low of 375 BTUs with a 5-point design for a better, more even heat distribution. This range's oven offers convection bake and six rack levels so you can cook multiple items simultaneously. Thermador's Pro Harmony 30-inch dual fuel range has four sealed Star Burners including two with an ExtraLow feature for a gentle simmer. The burners have a 5-point design that boils water faster and evenly with an overall output of 59,000 BTUs. The oven is electric with convection for precise cooking. It also includes a 2-hour self-clean mode. Thermador's Pro Harmony 36-inch all gas range has sealed Star Burners including two with an ExtraLow feature for melting and simmering. Every burner can reach up to 18,000 BTUs and has a simmer range of 375 BTUs to 3,000. Not to mention, the 5-point, pedestal design of Thermador's Star Burners makes cleaning effortless. 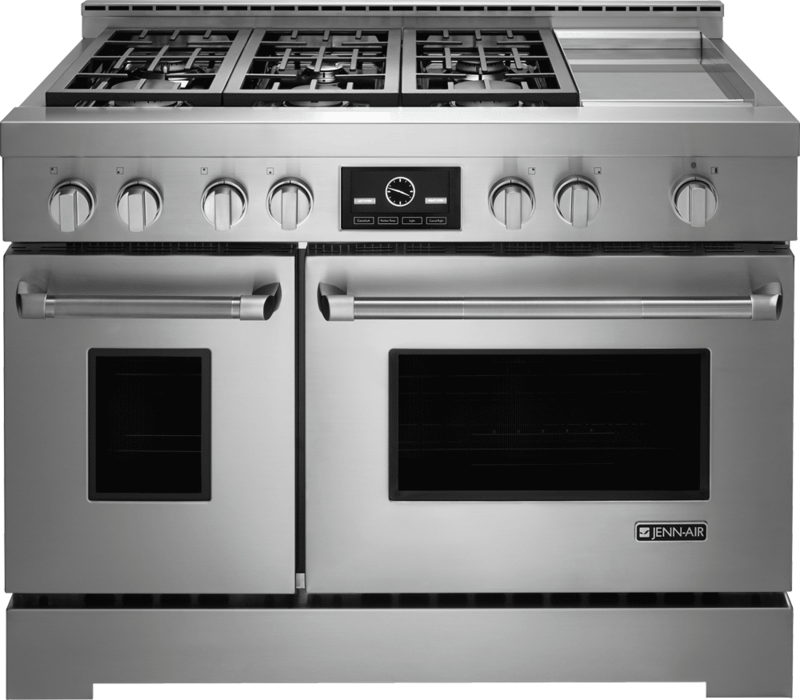 The convection oven includes six racks for multiple items to be cooked simultaneously and includes 20,000 BTU broil burners for a great sear. Thermador's Pro Harmony 36-inch dual fuel range has sealed Star Burners including two with an Extra Low feature for gentle simmering as low as 375 BTUs. Their 5-point pedestal design gives you less cold spots while cooking and a high of 18,000 BTUs for a faster boiling time. As for cleaning, the pedestal design provides easy clean-up and the convection oven has a 2-hour self-clean mode. The oven has professional racks that slide easily and safely on ball bearings, while also offering multi-level cooking. 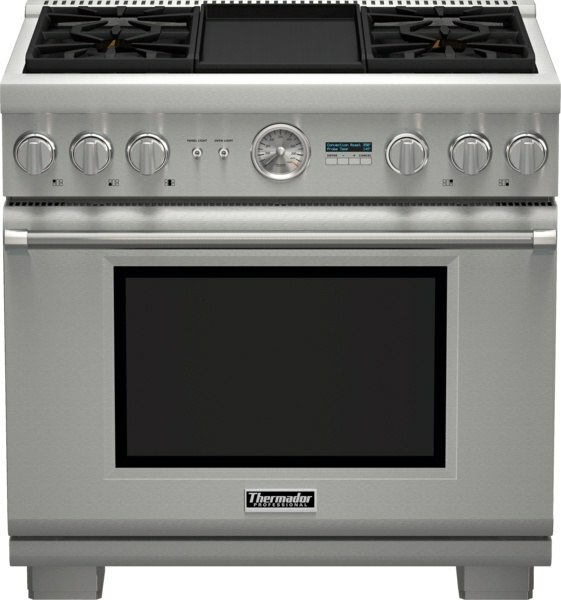 Thermador's 48-inch all gas range in their Pro Harmony series has six pedestal Star Burners and two with an ExtraLow feature. Select models have the option of a titanium, non-stick and rust-proof electric griddle - awesome for making those delicious pancakes while cooking your scrambled eggs. Their Star Burners offer a high of 18,000 BTUs and a range of simmer options from 375 BTUs to 3,000 BTUs. This range has the best simmering capabilities on two burners. One of the major benefits of this range is their massive cooking space. the oven has capacity is 4.4 cu. ft and includes a smaller oven of 2.2 cu. ft. 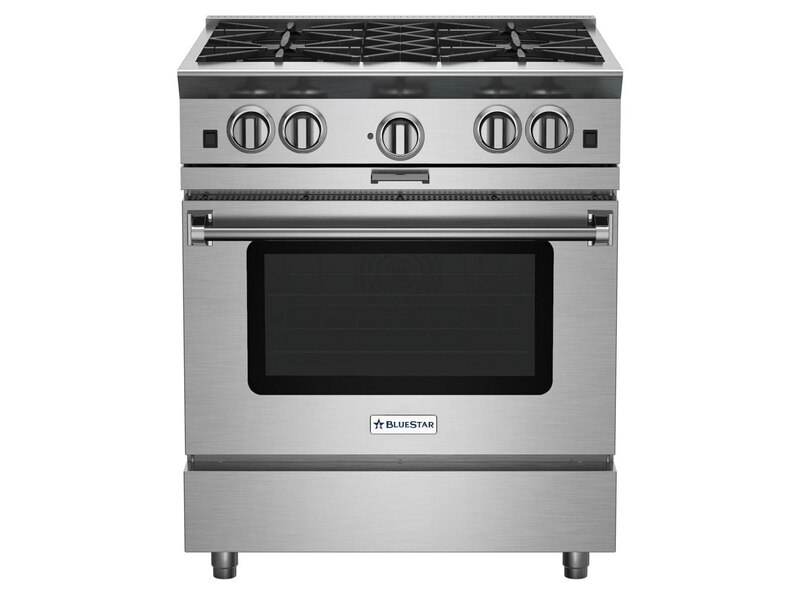 This Pro Harmony 48-inch dual fuel range offers you enormous cooking space with 5-point design Star Burners, griddle and grill options on select models, and 6.6 cu. ft. electric oven. Despite its size, this range offers easy clean-up with pedestal burners, a removable griddle, and a rapid 2-hour self-clean mode. Every burner has up to 18,000 BTUs of heat for optimal power and a range of simmer options from 375 BTUS to 3,000 for melting or gentle boils. As for the electric oven, it has third element convection designed for even airflow and multiple rack cooking while preventing taste crossover. Thermador's Pro grand 36-inch all gas range has 22,000 BTUs of powerful heat from their front right pedestal Star Burner burner and 4 with the ExtraLow feature. Their front burner is perfect for searing and fast boiling while their ExtraLow burners provide a range simmering options from a gentle simmer to melting without scorching. Their convection oven features their True Convection system for gourmet results. Not to mention, Thermador's Pro Grand series features their SoftClose door for incredibly smooth closing, and a fast 2-hour self-clean mode. 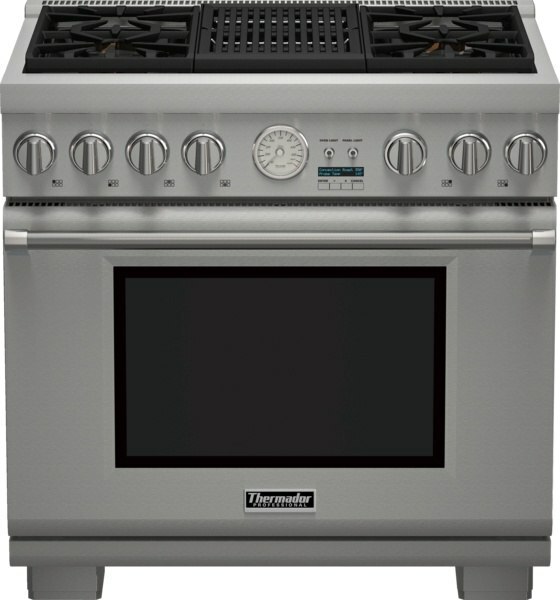 Thermador's Pro Grand 36-inch dual fuel range has powerful gas Star Burners and a 5.7 cu. ft. electric convection oven featuring their Third Element Convection for more precise cooking results for six racks of cooking. Additionally, their oven has a SoftClose door to prevent slamming for a smooth close. Their pedestal 5-point burner design allows for less cold spots and effortless cleaning. With 22,000 BTUs of high heat from their front right burner, you have great searing capabilities. 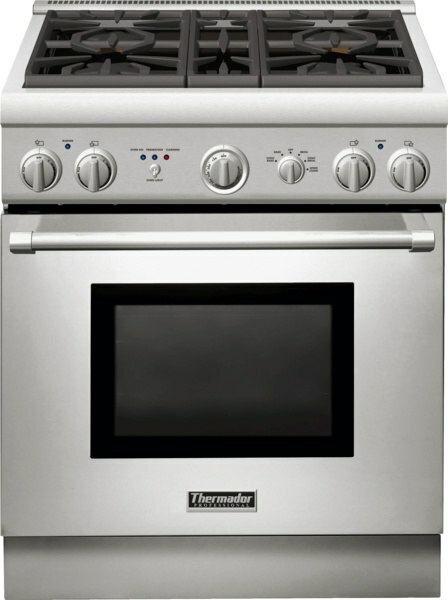 Their 4 ExtraLow burners feature a range of simmering options starting as low as 375 BTUs for a soft simmer. Thermador's Pro Grand 48-inch all gas range offers you massive space and high power. Thermador's powerful gas Star Burners and 5.5 cu. ft. convection oven featuring their True Convection system will help any cook have gourmet results. Additionally, their oven has a SoftClose door to prevent slamming. 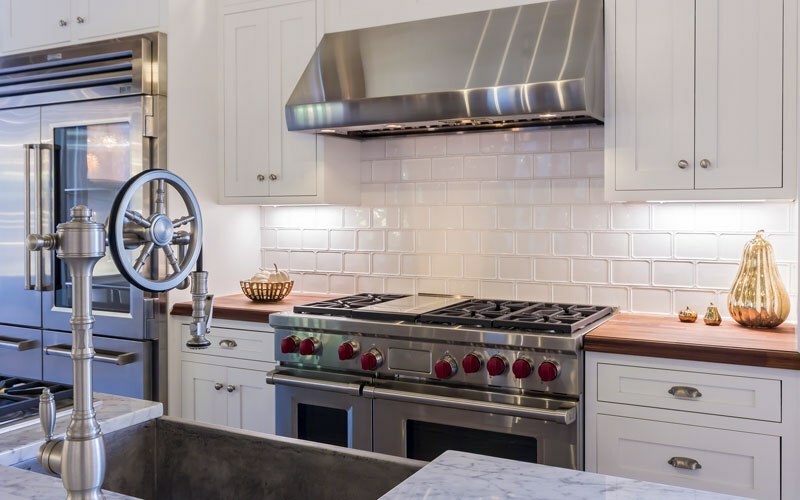 Their pedestal 5-point burner design allows for less cold spots and effortless cleaning.Their front burner that has up to 22,000 BTUs of heat is excellent for searing while their 4 ExtraLow burners have a range of simmering options as low as 375 BTUs for a gentle melt. Thermador's Pro Grande 48-inch Dual Fuel Steam Range is the first high-performance range with a steam and convection oven featuring seven cooking options. This dual fuel range features all gas Star Burners with a pedestal 5-point design offers less cold spots for any size pan, high power up to 22,000 BTUs on their power burner, a low as 375 BTUs for simmering, and an easy cleanup. What's unique about this range is their 1.4 cu. ft. steam and convection combination oven, a warming drawer, and an additional 5.7 cu. ft. (full-size) convection oven. The warming drawer has open sides for easy access and holds up to 10 dinner plates. As for cleaning the large oven capacities, the steam oven offers a steam clean function to keep it spotless and the convection oven has a rapid 2-hour self-clean mode. 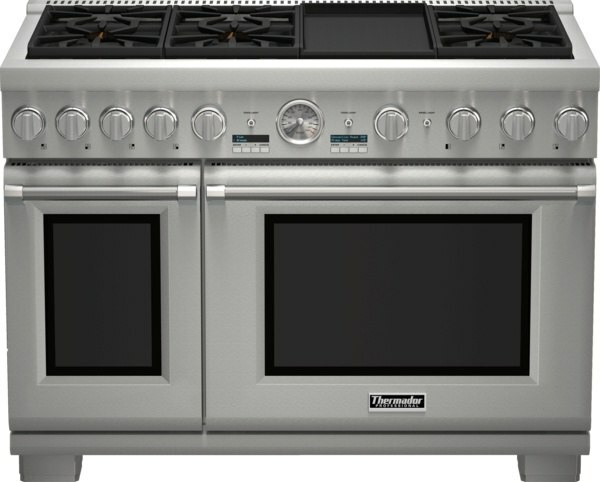 Thermador's Pro Grand 60-inch dual fuel range has the largest combined oven capacity in the industry at 10.6 cu. ft. There are two large convection ovens, a main convection oven that is 36 inches (large enough to fit a caterer's sheet pan) and a secondary oven that is 30 inches. 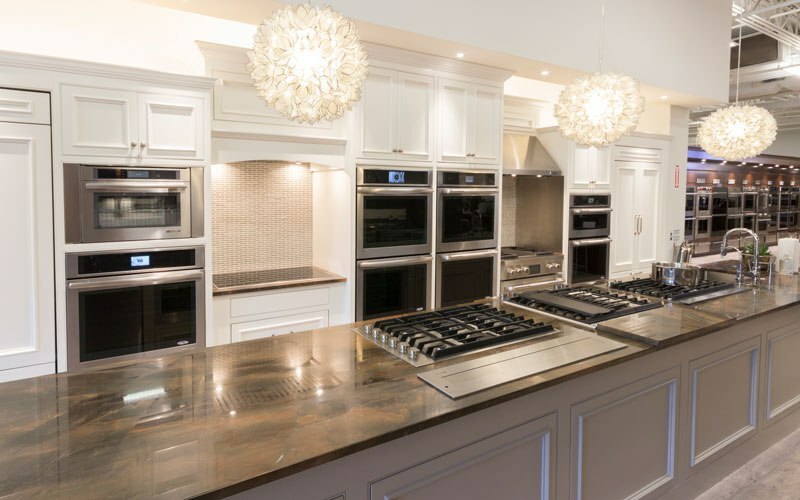 These ovens feature Thermador's True Convection system and have a 2-hour self-clean mode for easy cleaning and Thermador's SoftClose door to prevent slamming. Meanwhile, the cooktop portion features six gas Star Burners, and, on select models, the option of an electric indoor griddle, and a scratch resistant griddle. Perfect for the utmost cooking versatility, especially if you are entertaining. In the Duel Fuel models, you have the added steam and warming drawers. Jenn-Air's 30-inch Pro Style Gas Range has sealed burners including a stacked burner at 20,000 BTUs, perfect for searing, and a simmer burner from 850 BTUs to 3,000 BTUs. The 4.1 cu. ft. convection oven features six cooking modes and Jenn-Airs Auto Convection Conversion to take the guessing out of time and temperature while using convection for precise and effortless results. Not to mention, the oven is self-cleaning. As for aesthetics, this professional range offers a full-color touchscreen display for easy navigation of convection modes, times, and settings. At 30-inches, you also have the option of dual fuel featuring a gas cooktop and electric convection oven. Jenn-Air's 36-inch Pro Style dual fuel range has sealed burners including a stacked burner at 20,000 BTUs , perfect for searing, and, on select models, a high-performance electric griddle. It also has six convection modes for gourmet results. The burners have Flame-Sensing reignition in case your flame is accidentally blown out. If so, a spark will reoccur automatically and reignite. The 5.1 cu. ft. convection oven features Jenn-Air's Auto Convection Conversion to take the guessing out of time and temperature while using convection for precise and effortless results. Not to mention, the oven is self-cleaning and has Closed-Door broiling. As for controls, this professional range offers a full-color touchscreen display for easy navigation of convection modes, times, and settings, as well as Jenn-Air's My Creations to save previously used settings. Great for staple meals in your household. Jenn-Air's 48-inch Pro Style dual fuel range has sealed burners including two stacked burners at 20,000 BTUs, perfect for searing, and, on select models, a high-performance electric griddle, as well as six convection modes for gourmet results. The burners have Flame-Sensing reignition in case your flame is accidentally blown out. If so, a spark will reoccur automatically and reignite. The convection oven features Jenn-Air's Auto Convection Conversion to take the guessing out of time and temperature while using convection for precise and effortless results. Not to mention, the oven is self-cleaning and has Closed-Door broiling. As for controls, this professional range offers a full-color touchscreen display for easy navigation of convection modes, times, and settings, as well as Jenn-Air's My Creations to save previously used settings. Great for staple meals in your household. 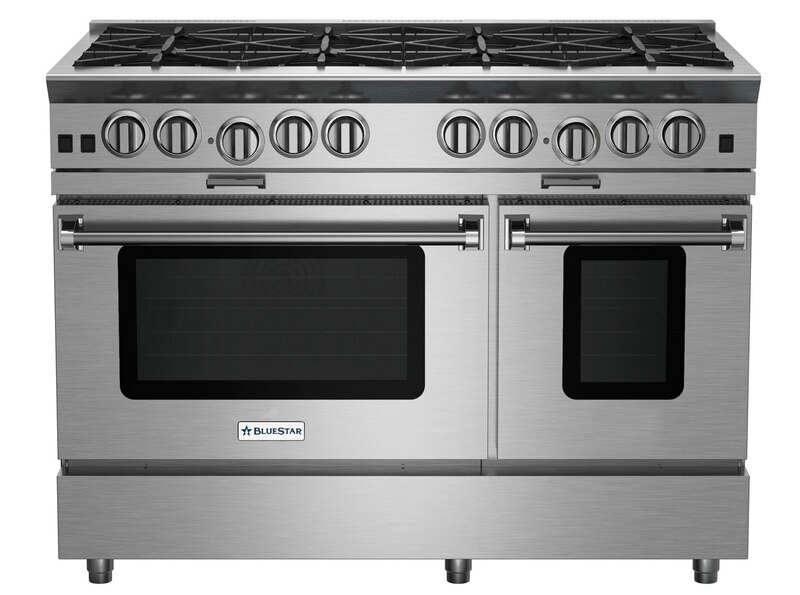 BlueStar's 30-inch all gas pro range has two 25,000 BTU PrimaNova open burners, including a precise simmer burner as low as 130 degrees, and an interchangeable griddle. At 25,000 BTUs, this is the most powerful stovetop. Their massive convection oven with an infrared broiler is perfect for full-size commercial sheet pans or produce intense searing in a matter of minutes. Their cooktop can be customized to fit your lifestyle with limitless options for a griddle, charbroiler, wok, French top, or burner placement. As for aesthetics, their professional ranges have over 750 colors and finishes to match any kitchen style. 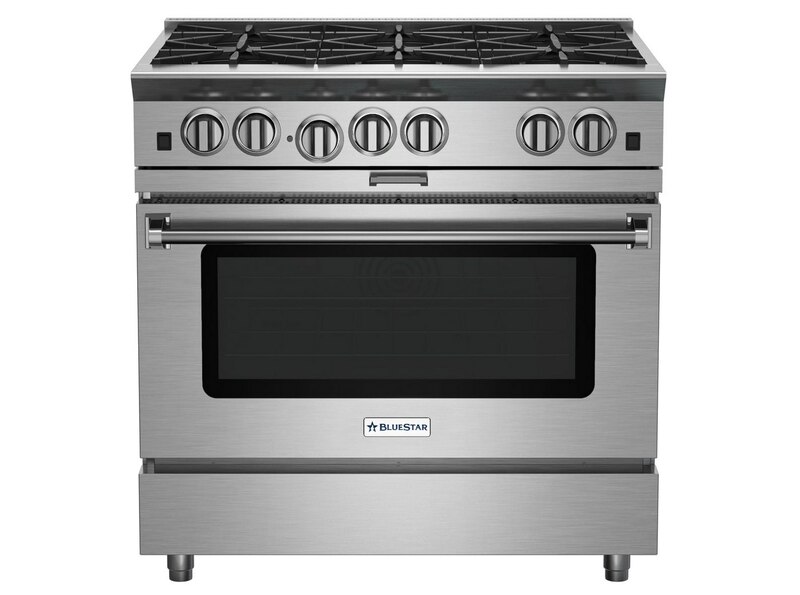 BlueStar's 36-inch all gas pro range has six open burners with up to 25,000 BTUs, including a precise simmer burner and the option of an interchangeable griddle. At 25,000 BTUs, this is the most powerful stovetop. Their massive PowR oven features their True European convection system with an infrared broiler. It's perfect for full-size commercial sheet pans or to produce intense searing in a matter of minutes. Their cooktop can be customized to fit your lifestyle with limitless options for a griddle, charbroiler, wok, French top, or burner placement. As for aesthetics, their professional ranges have over 750 colors and finishes to match any kitchen style. 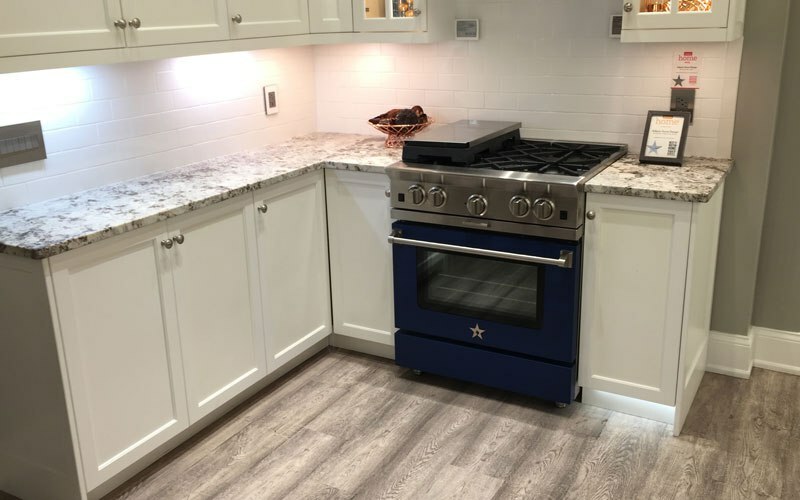 BlueStar's 48-inch all gas pro range has eight PrimeNova open burners with up to 25,000 BTUs of heat, including a precise simmer burner and the option of an interchangeable griddle. At 25,000 BTUs, this is the most powerful stovetop. Their massive PowR oven features their True European convection system with an infrared broiler. It's perfect for full-size commercial sheet pans or to produce intense searing in a matter of minutes. Their cooktop can be customized to fit your lifestyle with limitless options for a griddle, charbroiler, wok, French top, or burner placement. As for aesthetics, their professional ranges have over 750 colors and finishes to match any kitchen style. 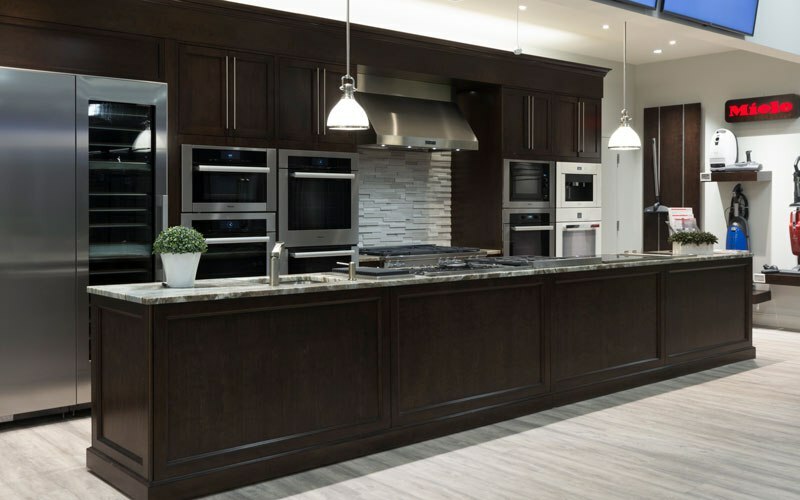 BlueStar's 60-inch all gas pro range has 10 PrimeNova open burners with up to 25,000 BTUs of heat, including a precise simmer burner and the option an interchangeable griddle. At 25,000 BTUs, this is the most powerful stovetop. Their massive PowR oven features their True European convection system with an infrared broiler. It's perfect for full-size commercial sheet pans or to produce intense searing in a matter of minutes. Their cooktop can be customized to fit your lifestyle with limitless options for a griddle, charbroiler, wok, French top, or burner placement. As for aesthetics, their professional ranges have over 750 colors and finishes to match any kitchen style. Our team can help you find the perfect pro range for your home.  Use the links below for more info about the top brands to consider or contact us. Wolf is the premier name in pro cooking, known for their quality, many cooking modes, and performance allowing you to cook in every conceivable way..
Miele is the newest professional range on the market. Although the burners are 19,500 BTU, the oven really distinguishes Miele from any other professional range. Miele has added automatic cooking controls that allow you to pick a food, enter the weight and hit start. Cooking is really that simple. Jenn-Air has great features for the price including 20,000 BTU burners, an interactive touch control screen, and twin convection for more even baking. Their chromium griddles are simple to clean. 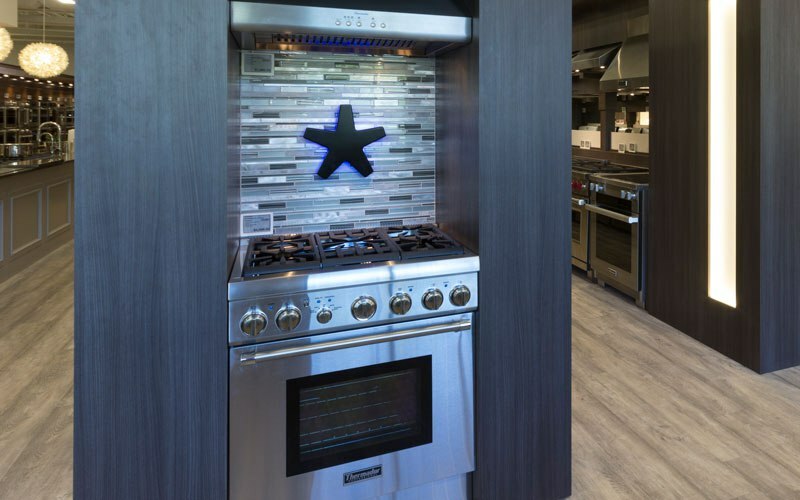 Thermador is known for their unique star-shaped burners for greater coverage, plus one of the best simmer burners on the market. Thermador offers two series of pro ranges, the Pro Harmony and the Pro Grand. An incredibly hot range with 25,000 BTU capability. It also features pure gas convection for more even baking as well as the hottest infrared broiler at 1,850 degrees. Start here to start learning about pro range brands, features, and trends. Over 250,000 people have already found answers in a Yale buying guide. Our Pro Range Buying Guide is the perfect place to start when researching for new appliances. We’ve answered all the most common questions and concerns about choosing a pro range in this in-depth, educational video.